Gluten-Free Crusty Boule, the Video! Well it is official, our readers are as obsessed about bread as we are. I know this because so many of you watched a video about dough rising! In fact, I did this post to satisfy the folks using our gluten-free chapter from Healthy Bread in Five Minutes a Day and their desire to see the dough in action. I mix up a batch, let it rise, shape and then bake it. Handling the gluten-free dough is very different then our other recipes, so I hope having a video will be helpful. Find the Gluten-Free Crusty Boule recipe here. Thanks for posting this video and announcing it on Facebook. It really helps. Thanks for the tips on the wet hands, shaping, and how to use the knife. I appreciate it. I had some leftover GF dough and made great grissini from it. Hoping to make the GF cinnamon rolls. I have been dieting. I am commited to eating these through the diet. What would your suggestions be for one of your lowest calorie breads? THANKS! … it turns out that the “germ” of wheat and other grains contains oil, and oil is a concentrated calorie source. The carbs are a little lower (not all that much), but the calories are the same. Thanks so much for this video, it definitely took the scary factor out of trying to bake gluten free bread. It’s in the oven right now! So glad you are giving it a try! This is unrelated to the above post, but I had a question. When I make the berry bread or carrot bread it tastes bitter. Am I doing something wrong? How old is the dough when you bake it? Do you have the bucket vented so the gas can escape, it sounds like it is overly fermented? This will happen more rapidly with dough that has sweetener (or fruit) in it. Timely demo, Zoe. Thanks so much. My GF dough has been so sticky wet although I’ve followed your recipe. I’ll use this video to watch how I handle it, hoping for improved product. Thanks for the video. I was wondering if you have experimented with additions to the gluten-free recipes like fruit and nuts for Holiday baking. In particular I was looking at the Stolen recipe in HBin5 on pg 279 and wondering if I could augment the GF boule or GF brioche into a fruit holiday desert bread. Does the suspended fruit weigh down the dough too much? I would love to get your insight. Thanks. No, I haven’t tried adding fruit to the brioche, but I think it will work. I would just recommend adding a little at a time to make sure it doesn’t get too heavy. Perhaps cutting the fruit into small pieces will also help. I LOVE the idea of doing a g-f stolen! I will have to give it a try. I made this bread today and it failed to rise. Well, it did a little, but the end result was doughy and wet. Any ideas what I did wrong? The water temp was 110* when I mixed with honey & oil & added it to the flour/egg mixture. I let it rest 75 min after shaping, very little rise in the oven. Help! Love working on making our family’s favorite loaf. I struggle with the loaves being too wet so asked for a kitchen scale for Christmas to weigh my flour!! At Pot Lucks I am called the Bread Lady! Everyone always wants me to bring the bread…I wonder why?! I am trying to accomplish two things: First, my husband despises the taste of both tapioca and cornstarch., so I am on a quest for a good substitute in the GF Boule recipe. I was thinking about eliminating the 3 cups of tapioca flour and using one and one-half cups of arrowroot flour and leaving everything else the same. Secondly, I like this recipe with the eggs, but will it work without eggs? I was going to try using 4 T flaxseed ground and combined with 2/3 c. water instead of the eggs in the boule. What do you think? Any other suggestions? I have never tried this with arrowroot flour. If you try I’d start with half a batch. Please let me know how it goes! Gotta tell you that this bread made my bestest friend in the world cry with joy. REAL BREAD!!! Real crust, real EVERYTHING she has missed. Thank you so much! A friend posted a link to this on facebook. I tried it and was hooked! I have so missed good, really good bread since I was diagnosed with celiac. You have totally changed my eating. I bought the book, and I have been telling all my friends about it. I made the gf brioche so many ways. I made mini cinnamon loaves that were a HUGE hit. I also took freeze dried blueberries and added them to the dough and made blueberry muffins. Fantastic even though I forgot the dough for a few days. I am inspired to bake again. Something I thought I would never really enjoy again. My familiy, who can eat wheat, loves the gf recipes even. The wheat recipes are so easy that I am even willing to make those for them. Thank you so much! Some people have a sensitivity to the cornstarch, which is used to achieve a soft interior crumb, like a french baguette. If you have a sensitivity you can replace it, or part of it with Tapioca flour. You can also make the boule recipe using olive oil to get a heartier loaf. Are you allowing the dough to chill before you bake it? This may work better at high altitudes? Are you using the scoop and sweep method of measuring your flour? Hello again! The bread did bake up nicely with a golden crisp crust, and a nice texture inside – although a little bland – more salt? I was unable to slash it before baking because it was truly the texture of tapioca pudding, but it didn’t explode into any shape different than when it went in the oven. It had little brown peaks on it from detaching it from the spatula and peel. Maybe I just need to add more rice flour? It does seem a bit strange to snack on that much cornstarch though. First let me say how thankful I am that you included a gluten free section in your book!! I have made the GF Crusty Boule and the GF Brioche(as a loaf) and I loved them both. I have a question regarding the honey in the Brioche recipe. I like the texture of that bread for sandwiches but find for everyday use it is bit sweet for my taste. However I know honey is a humectant so I was wondering if you(or someone else) have ever tried lowering the sweetness while keeping that same great “feel”? Do I need to substitute another liquid ingredient? If so what would you recommend? You can try reducing the honey and replace it with water. May want to start with a half batch. Please report back and let me know how it turns out! Hello – thanks for your reply! Yes, the dough was chilled before using. I also did use the scoop and sweep method. I think maybe my eggs were too big? They come from chickens running around my neighbors yard, and so they are not sized, and they are large (and tasty!) I stirred in a little rice flour, and am trying again tonight. Yesterday’s loaf is gone – despite my misgivings about the cornstarch, it was delicious! No, I’m not sensitive to cornstarch, it just sounded like so much, and a bit weird, but I’m a convert now. Cindy: Yes, very large eggs would certainly change the liquid content, so that could be the issue. Could you take this same GF dough and bake it in a loaf pan. I like to eat toast in the mornings but the round loaf slices don’t really fit into the toaster. Another celiac is coming to visit us next week and he REALLY loves cinnamon raisin bread. Do you think the boule could support raisins? Jenn didn’t write back to say how her stollen baked up. I thought I’d just add cinnamon to the dough. add the raisins to those doughs, but go easy, GF dough isn’t as “strong” as wheat dough and the raisins could promote a heaviness. I’ve made many a GF loaf of bread in my Zo machine. At the urging of a good friend who has converted to your 5-minute method, I have just mixed my first batch of GF Boule dough. To make it extra-challenging, I’m making hamburger buns first! I’ll bake them without the steam bath for a softer crust, I hope. I’ll let you know…Wish me luck!! Well, another celiac is in L-O-V-E with your bread. I decided to make the basic recipe and it was wildly successful. Thank you! All of us enjoyed the loaves, so now he and his wife are buying your book and baking bread jeff/zoe-style. I recently made a large batch of HB in 5 and a batch of GF for a fundraiser in a commercial convection. I am not sure if I need to increase the water. I baked 2 racks at a time with 12 loaves on each rack. Can you please tell me if I need to increase the water for steam and if there are any other considerations when using a large commercial convection oven? Thank you! CORRECTION: I BAKED 6 ROLLS ON EACH RACK FOR A TOTAL OF 12 IN THE OVEN AT ONE TIME. Thank you. P: If the oven is larger, you need to use proportionally more water (eg., twice as big an oven, twice as much water). But… strong convection ovens sometimes blow all the steam out of the oven, and this just may not work. What problems did you notice? Did the crust fail to crisp and brown nicely? That could be a sign of inadequate steam, or steam that got blown away by the fan. Thanks so much! I lowered the temp, changed the fan form high to low, and increased the H2O. Your customer support is AWESOME! My last comment was about using white whole wheat flour… and then two weeks after I’d started with ABin5, my wife discovered she probably has celiac disease. So I have started over with HBin5 and the GF recipes with GREAT success. I noticed that you credit Shauna and Danny with helping create this recipe. Shauna wrote earlier this year that she is moving away from xanthan gum and using flax seeds and chia seeds instead to get rise/air pockets. (http://glutenfreegirl.com/chia-seeds-and-flaxseeds/) Have you experimented with this at all? 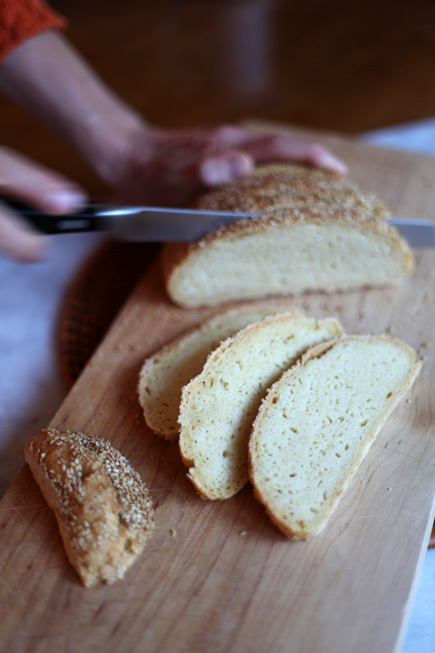 Do you have a recipe for a basic bread without xanthan gum? Jen: We haven’t tested dough storage with Shauna’s new approach, and that’s central to our method (storage, to save the prep time). So that’s the question– will leaving out the gum give you a dough with enough structure to be stored? Please let us know if you have success with this– I’m a little sceptical. Jeff, I’ll have to finish the bag of xanthan gum I have first! 🙂 When I do try it, I’ll report back. Just wanted to pass some bread love your way. I have tried both the gf crusty boule and the no rye bread…they are both fabulous. Thanks for all your hard work on the recipes and for bringing fresh bread back into my home. I’m trying your gluten free recipes. I’m making the “rye” type one with the teff flour today. Question–are all the gluten free flours in this section using the scoop and sweep method of measuring flour? Because this recipe has a much firmer texture after mixing. The recipe by Gluten Free Girl is much looser, so I am wondering how they measured their flour. Thanks so much! I just returned from Office Depot. My HBin5 book binding fell apart. Actually, the same thing seems to be happening with much of the baking group. We use the book a lot! I tried gluing the binding several times. I hesitated about changing it to a spiral bind, as some of the others did. I I love seeing your smiling faces on the cover every time I take out the book to bake! Well, I got a clear cover. I asked the guy to please cut up the front part of the book jacket into a first page. It looks just wonderful! Your smiling faces still inspire me when I see the cover and the book lays flat when I open it! I was trying to thicken up my brioche dough, and it was taking a lot more rice flour to thicken it. I decided I didn’t want to work at making the Super Sam rolls for our HB5 project. I am making a coffee cake in a tube pan instead! The problem, I am noticing is that gluten free dough doesn’t seem to rise in the pan if it’s made the day (or more) after the dough is made. I get much more rise right after the dough is made. Anything I can do to help the rise a few days after the dough is made? Is this happening with the new dough or with the first one that you thought might be too wet? This has been happening with the previous doughs. I made gluten free boule dough and refrigerated it overnight. I didn’t rise., the bread came out like a brick (I made it in a foil loaf pan for the Farmers Market). I ended up making it into croutons. Same thing with the g-f dough with olive oil. Didn’t rise the next day, when I tried to bake a bread. Made 9″ pizza crusts out of them. I think that one time, I baked the olive oil dough right away, it had a wonderful rise. But whenever I refrigerate it overnight (which is recommended), it won’t rise. We have to remember that my weights on g-f flour was different until only recently. But why would that impact why the dough wouldn’t rise in the loaf pans? I just checked the g-f “Super Sam Coffeecake,” in the tube pan, that I put up to rise 2 hours ago. It rose beautifully! I had added a lot of brown rice flour, maybe a cup. Why this rose, and not the others, puzzles me. I’d like to get a handle on this. I’m getting involved with the gluten free support group here. They will have a tasting on Tues eve. I probably won’t be making brioche for sale; the ingredients came to about $5 (used soy milk). But there are others I could make. I’ll probably need to freeze them ahead of time so I am not baking g-f the same time as other items with gluten. PS–I had a “happy accident” with the Anadama dough last week. I was baking for the Farmers Market and decided to do round loaves instead of loaf pans (I usually do that). I had to run out for awhile. By the time I came back, the loaves were spread out on the sheet pan . They were about 8″ diameter and 2″ thick. Turns out that people LOVE these! They sell them at Jason’s Deli, they are a New Orleans favorite. I have people requesting them now! I spoke to a woman yesterday who might order 4 for her family reunion. They are great for “make ahead” sandwiches, so the olive juices can blend with the bread. But what about my problem with the breads not rising the next day? Have you tried letting them rise longer? Is your dough particularly cold? Are the loaves larger than normal? Hi Zoe, I had the loaves in the fridge overnight for a cold rise. I used foil loaf pans (so I could tell which the g-f loaves are, and which aren’t). I also figured the heat would work better on the foil pans, but I am not sure. Even with a few hours to let them rise, they didn’t. BTW, I just figured out a trick to warm up loaf pans after they have been in the fridge overnight. After you take them out, put them on a towel (to absorb the cold) or on a cooling rack (to get the heat circulating all around.). Really helps warm them up faster. Any ideas as to why they didn’t rise, after a couple of hours? THANKS. It must have more to do with the dough than the rising? You are just scooping the dough into the pan and not handling it much at all, right? What kind of flours are you using? I’m just using your g-f crusty boule and your g-f with olive oil. Maybe it didn’t rise the second time because my measurements didn’t include enough flour when I scooped and sweeped? The dough did rise in the coffeecake I made last night with the g-f brioche dough, AFTER I added more brown rice flour. I’ll give a g-f recipe a try again today, with your flour measurements. I’m going to do the gluten free with olive oil. I’ll make the recipe today and make the loaf on Sunday. I don’t have your soy flour measurements, but there’s only 1/2 cup of soy flour in the full recipe. I’ll try my best. Yes, I am just pouring the dough into the loaf pan. I’ll let you know after Sunday. I came up with 1 3/4 oz of soy flour to 1/2 cup. Does that sound correct? Wow, my “dough” doesn’t look like the spongy dough in the video! I think I watched the video awhile back, but forgot about it. It was awhile later when I began trying to make any gluten free breads. My dough looks more like pancake batter. Today’s gf dough with olive oil looked more like thick hummus. I just remembered, when watching your video, that I used guar gum instead of xanatham gum. It costs less, and I had read that you can sub the same amount. Could that be part of the problem? I do see that my measurements were off, but maybe there was more too it. I really mixed the dough well in the mixer today. A KA recipe said to mix the gluten free doughs really well, their recipes don’t work as well by hand mixing. Your boule, however, looks great and you mixed by hand. I wonder if it’s possible to overmix, because today’s batch only rose to 4 qts instead of 5. The dough is in the oven till Sunday. Maybe I should add more soy flour, I was about 3/4 oz off. Does that information help you figure out what’s wrong? Thanks so much!!! I’m not sure what the issue is, unless the guar gum is having an effect. If you change the recipes it is hard for me to know what might be up? You may just need to do some experimenting until you get to the right consistency. Maybe I should just plunk down the money and get the xanathan gum. It all depends on what happens at the gluten support meeting. The pizza crusts don’t need a lot of thickness, so this dough will be ok. If there’s demand for g-f products, I’ll buy it. In the healthy bread book page 238 and 244 are recipes calling for soy flour. Is there another flour we could use as a substitute? Our son is allergic to gluten and soy. Thank you so much! We’ve loved all the recipes we’ve tried. We have had good luck substituting any other bean flour. You can try garbanzo. Instead of doing more gluten free baking (which has it’s own learning curve), I’ve decided that I want to use the HBin5 gluten free flours in the book in a multigrain loaf. Someone else at the farmer’s market, makes a multigrain loaf. She took a honey wheat recipe as her base (no eggs). Then she mixed up a variety of flours–oat, soy, millet, flaxseed, sunflower seeds for the other half of the flour (she subs that mixture for the remaining whole wheat). It’s a small loaf, but she charges $6.50 for the loaf– the grains do add up in price. I’ve traded her for it, and it’s really tasty toasted. I’m looking thru our HB5 book, but there isn’t a multigrain bread. You guys have any suggestions as to which bread might be a good base? If it doesn’t have eggs, it might appeal to vegans (we do have requests for vegans). It really doesn’t need to store more than 5 days. I’m finding that I make a dough on Sunday, shape the loaf on Monday, do a cool rise, and bake on Tuesday. This works for my egg breads/challah (good seller), Anadama bread, and AB5 master dough w/starter. Maybe we can create something new and tasty! Sounds like you are embarking on an adventure in baking! Have fun and I hope you invent a loaf that you love. Maybe you can start with the Betsy’s seeded loaf? If you are trying to sell this as gluten-free, then you can’t add any vital wheat gluten or whole wheat, but if you just want to experiment with all kinds of things go for it and have fun! So my friend’s loaf is half whole wheat flour, and half multiflours, if that isn’t clear. I could add more vital wheat gluten and whole wheat flour to give it a bigger rise and loaf, I guess. No, I don’t want to make this as a gluten free loaf. I’ve given up on gluten free for now. How about mixing up what flours I do have in equal proportions and trying the Ten Grain Loaf in the book? It sounds like one of you tried making the bread with a mixture of flours. Have you ever tried usuing Lupin Flour.? It is availabe here in Austrlaia and i like to use it in my G.F baking and of course my bread. i have just purchased your book and am about to start baking!! I’ve been gluten-free for over a decade now, but this is the first time I’ve experimented with your bread method. My dough was full of air, but very sticky, and fell quite a bit when I picked it up to shape the loaf; it did rise some on the counter and then got decent oven spring, but the whole thing spread sideways and ended up less than an inch thick. Delicious, but the slices looked like biscotti. I read the trouble-shooting section, and it says to add 1/4 cup more flour – do you have a suggestion on which of the four flours in the recipe to add? I tried using the rice flour, but am curious if you’ve found one or the other better for stiffening the dough. In spite of the short loaf, the crust is delicious and crispy, and the whole thing probably won’t last long enough to worry about it going stale! We saw your recipe for this, posted on your website on January 5, 2010, and you used a dutch oven to bake the bread. In this demo video, however, you didn’t. Which one reflects your thoughts on the best way to do the GF bread? And if you prefer to use the dutch oven, what do you see as the benefit? Thanks!